An anode plane assembly (APA) is prepared for installation into ProtoDUNE. This 3-D display shows a particle event at ProtoDUNE. The video shows the full size of the ProtoDUNE-SP detector (white box) and the direction of the particle beam (yellow arrow). Particles from other sources (such as cosmic rays) can be seen throughout the white box, while the red box highlights the region of interest: in this case, an interaction resulting from the particle beam passing through the detector. Event information, such as the momentum of particles in the beam and time of interaction, are located in the lower left corner. For curious minds that want to play with the interface, a selection of 3-D events from ProtoDUNE-SP are available in an online gallery developed by Chao Zhang of Brookhaven National Laboratory. 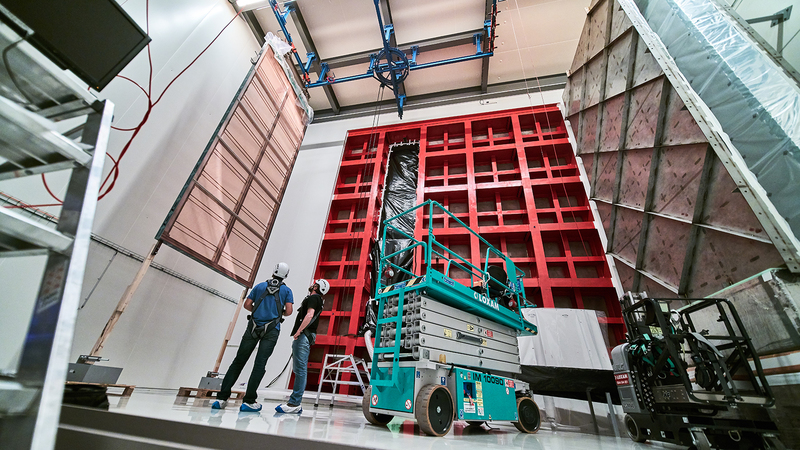 “It makes ProtoDUNE a great stress test for the detector and reconstruction capability,” Yang says. If the software tested at ProtoDUNE can handle the high number of particle interactions, it will be almost overqualified for the more serene environment of DUNE. Fermilab’s accelerator complex will send trillions of neutrinos through 800 miles of earth, but the far detectors will see only a handful every day. 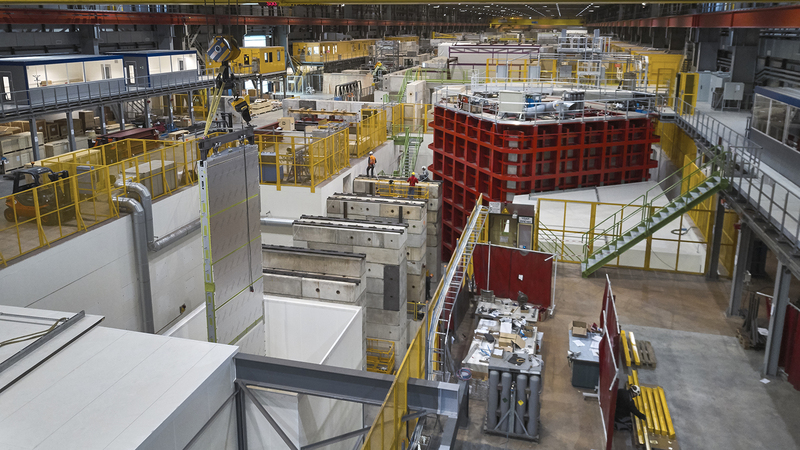 However, ProtoDUNE-SP’s robust data handling capabilities are needed to search for rare subatomic phenomena, such as the hypothesized decay of protons. It also ensures that DUNE can handle thousands of neutrino interactions in a few seconds if, say, a star explodes in the Milky Way. ProtoDUNE-SP also collected particles at the full range of energies DUNE expects to see: from 1 to 7 gigaelectronvolts (GeV). In fact, data-taking went so smoothly at these planned energies that researchers even had extra time to capture lower-energy particles, from 0.3 GeV up to 1 GeV. With precise control over the beam, scientists were able to carefully study how particles interact with the argon atoms – important physics studies in their own right – and test the detector components within. DUNE already has around 1,000 members from more than 30 countries and continues to grow. With all the ongoing planning, construction, and testing taking place around the world, the team of DUNE scientists and engineers, it seems, will have a busy and collaborative 2019. A pair of results bring neutrinos into the new era of multi-messenger astronomy. University of Manchester’s Stefan Soldner-Rembold will join Edward Blucher of the University of Chicago as co-spokesperson. What's it like being a theoretical neutrino physicist working on the Long-Baseline Neutrino Facility?